I offer hand stitched finished counted cross stitch products for sale. I make everything from cross stitch patterns, finished cross stitch cards, bookmarks and both simple and intricate tapestries and pictures. A few years ago I found myself tranformed from busy executive with NO spare time, to undergoing chemotheraphy and having TOO much time on my hands. So I began cross stitching like crazy. After overfilling my home (and almost everyone else's), I decided to offer up some of my work in the hopes of bringing a smile to other people. I do ship internationally, just contact me so I can determine the correct shipping rate. I hope you enjoy my work. Keep in mind that I am also very willing to make up custom items. I have the capability to create any custom design I want or make a custom design from a photo. I will consider all offers. Just B-mail me here or e-mail me at bookieanalyst@gmail.com and let me know what you have in mind. Thanks for looking and have a fabulous day! CrossStitchNerd doesn't have any items in their booth! 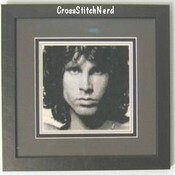 Recently purchased a hand-made custom designed cross-stitched â€œJim Morrison Portraitâ€ for a family member and when I opened my package, I was in AWE! Incredibly detailed and a very time consuming product. If you are seeking a gift different from the rest, I highly recommend CrossStitchNerd for your purchases. You will not be disappointed. CrossStitchNerd is a true professional in her field and a wonderful individual who communicates extremely well with her customers and goes above and beyond to excel in Customer Service. Thank you! What a joy it was working with CrossStitchNerd/Linda as she cross-stitched some beautiful items for my gift giving needs. I am so pleased and will remember her whenever I can use her talent for my uses. Thanks, Linda.